For nearly a century, Turkey has been a model of a modern secular Islamic nation. As a member of the G-20 and NATO, a candidate for the European Union, and boasting the world’s 16th largest economy, Turkey’s influence in regional and international security and economics has steadily grown. Yet modern Turkey is at risk from a rising conservatism, willing to trade economic growth for human rights advances. 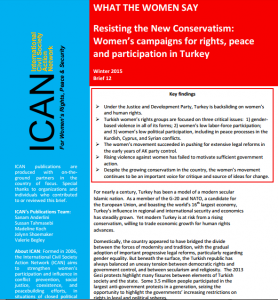 This brief examines the current challenges of women’s and civil society groups in Turkey, highlighting effective initiatives and advocacy strategies. Turkey offers significant lessons for other countries similarly struggling to maintain the momentum of democratic reform in the context of growing conservatism. The stakes are higher than ever for international actors, Turkish civil society, and women’s rights groups to strategize and work together effectively.